This was a day of two halves, after breakfast things disintegrated somewhat, initially because of shut metro stations and later because of bulk people. Leaving the hotel I met an Australian couple I had said hello to at breakfast, they had been to Versailles yesterday and said the queue had been two hours long. 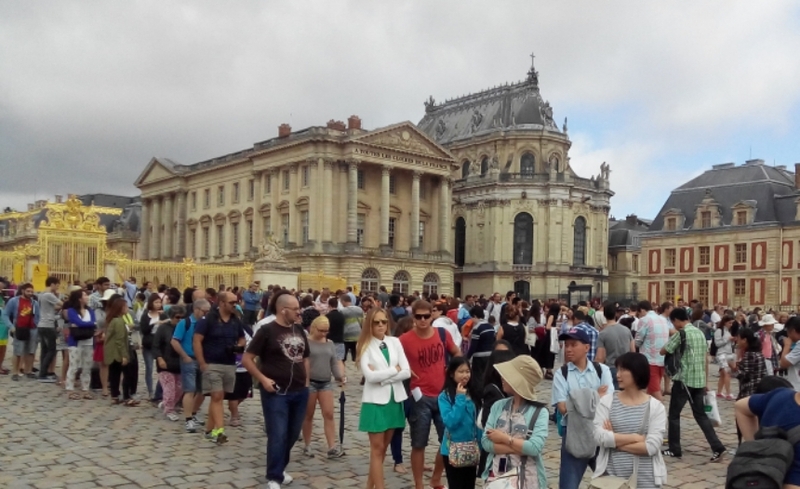 Royce and I had arranged to meet at Versailles, probably in the queue, but I had not imagined how bad that queue could be. There may have been 10000 people and we queued for over two hours. The palace is very large and very splendid but most rooms were so crushed with tourists that you needed to hold your camera above your head to take a photo. Fortunately when we got to the gardens they are so large we could find a peaceful spot to eat our sandwiches (filled rolls in our terms) and drink our cans of fizz. After the long walk from the end of the gardens back to the station and 2 train changes I got back to the hotel after 6pm pretty weary and sore. On the train there was an Italian family sitting opposite us and the children showed signs of restlessness until their father gave them their drawing pads. So I got my pad out and showed the kids some drawings and then sketched a portrait of the boy (Marco). The drawing was a bit rough but the kids and their parents seemed to enjoy it. A shower and a lie down fixed my weariness and I have just finished dinner at a nearby restaurant. Duck with potato bake followed by creme brulee. Salve, volevamo ringraziarla di nuovo per la sua gentilezza. Abbiamo visto le sue opere e le abbiamo fatte vedere anche ai bambini. Distinti saluti da famiglia Versari. Hi Quilliam, A big and tiring day for you . Loved the piece about the drawing pads. The Italian Family and especially young Marco would have been surprised, and surely impressed! Just about time to come back down to earth. Make the most of the heat of Singapore as there is a good possibility of a solid Canterbury Southerly with a little snow when you land on Tuesday. We will pick you up once you clear customs.